Keen readers of Chandoo.org would have noticed a slow down in new posts recently. There are a few reasons for that. I went to Malaysia to conduct Excel Dashboards & Power Pivot masterclass. After coming back, we (our family) went to Goa to vacation for a few days. When we got back, we all fell in to a vicious loop of flu, body pains and fatigue. And it took a few days to recover and fall back in to routine. 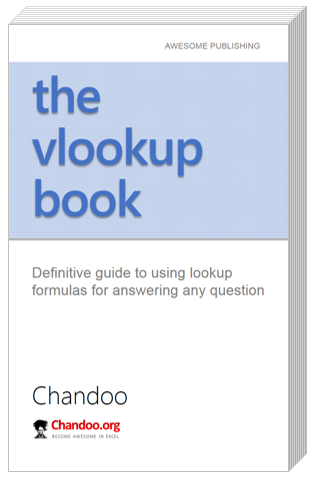 I am very glad to announce my newest book – the vlookup book to help you become awesome in answering any lookup related question. These days, any kind of work involves understand data & answering questions. Whether you are a school teacher or drilling site manager, you are always answering questions like, “What is the GPA of Sam in Grade 6?”, “Who dug the hole number 6925?”. And how do we answer these questions? Using Excel of course. And this is where the ubiquitous VLOOKUP formula comes in to picture. Along with few other formulas like MATCH, INDEX & SUMIFS, VLOOKUP can let you answer almost any data related question you have. And my latest book helps you do this better. The vlookup book is a no-nonsense guide to demystifying VLOOKUP formula and its cousins, so that you can answer any question related to your data without wasting too much time. The book will be available now. Meanwhile, download free sample chapter to get a feel of this book. This book will be available as ebook thru our site & Kindle platform. I will be adding Apple iBooks version later in November. There will be 2 versions of the book – eBook & vBook. vBook will be video version of eBook. I am self-publishing this book. I have no immediate plans to offer a print version of this book. But if there is enough demand we might have something ready in next 2 months. Visit the vlookup book page for more updates & to get your copy. So that is all for now. I am really excited to have this book ready and eagerly waiting for launch date. I know I say it many times. But it is never enough. I could not have imagined writing a book without your support. Thanks to your passion for learning, I wake everyday with a big smile and think of ways to help you. Thank you so much for supporting Chandoo.org and becoming awesome. Good to hear this news. All the best..
Congrats Chandoo. I wish this book to be a very good success 🙂 Continue your good work. THanks Very Much and All The Best. Since you are self publishing it, I thought of mentioning http://pothi.com/pothi/ . They help in writers publish their books via self publishing. Please consider offering a downloadable PDF version as well. A downloadable PDF version would be great. impatiently waiting, all the best! It's really good new, have a good day in malaysia too. All the best for your new project.. Looking forward to learning from your book. Was glad to read you are much recovered now; hope you return to normal health soon. Look forward to buying the book once published. We Wil Wait For That Eagerly. What a teaser..... c'mon! Let me buy it! I look forward to seeing the book. VLOOKUP has long been one of my favorite Excel features, but I am sure I'll learn many new tricks from it. One thing I wish Microsoft provided in VLOOKUP: an easy way to define the behavior when a lookup fails. Right now I often find myself building ugly nested IFERROR combinations to make VLOOKUP do the right thing. Its really a good addition for Excel knowledge. Thanks everyone for the best wishes and love. The book is ready now. Please visit http://chandoo.org/wp/resources/the-vlookup-book/ to pick up your copy. Awesome stuff chandoo. Just picked it up, plan to go through it this week. Though I have no doubt it's top notch like all of the other products (and free things) you offer. Can't beat it for $10. Hi Chandoo - is it possible to share a sample vdo clip of your book? Just wondering will these be new recordings or combination of what you offer in the Excel training school. Hope the next book will be on the world "IF". Hi Purna, So glad that you have created this book for people like me who spend lot of time using Excel to conduct basic data mining using VLOOKUP function a lot. Probably you can write a book on SQL as well. Thanks again. I want to purchase this book. But problem is that i can pay only in INR. Please tell me the way. Bought the book and it looks great. will you at some point be providing your own answers to the homework questions you have set. You'll have to buy the next book to see the answers!